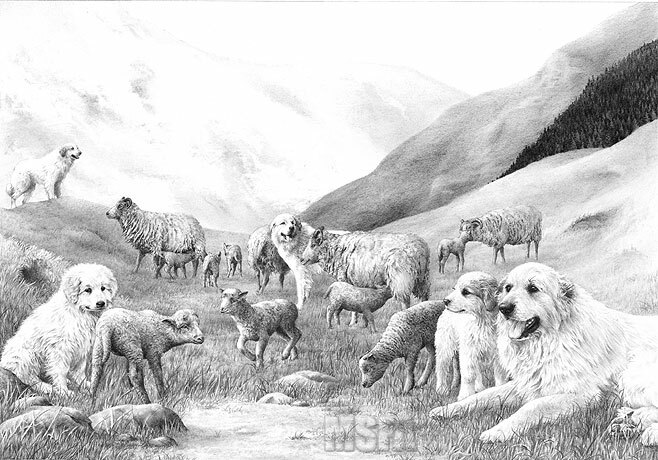 I was commissioned by the Pyrenean Mountain Dog Club of Great Britain to produce three limited edition prints. The initial drawing and this, the second, were small studies leading up the release of the major study in their Golden Jubilee year. This time the Club stipulated the inclusion of multiple dogs and pups - an unlikely scenario, which I argued against and toned down to the drawing as seen. Once again the club supplied their stock of images for me to work from but I had already exhausted most of the possibilities. As a result, although the setting is based on real scenery and the dogs are authentic, the sheep are our own Manx Loughtans — very few of which (none) are to be found in the Pyrenees! The original drawing took 36 hours to complete and is now in a private collection in the USA.